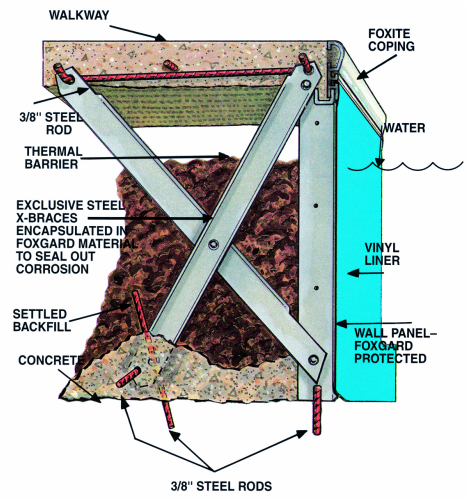 Fox pools use some of the same technology used in building bridges, tall buildings, water towers, and other structures that require high strength due to high stresses. Your swimming pool holds thousands of gallons of water while holding back thousands of pounds of earth. In order to ensure structural integrity over many years it’s important that your pool walls will remain intact regardless of external forces. With the Fox X-Brace technology you get just that. 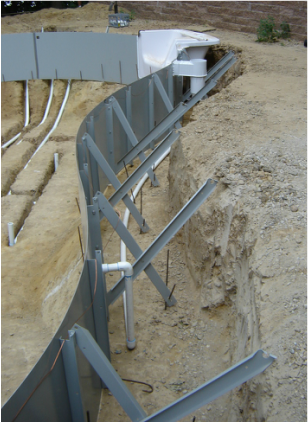 Patented by Fox, the X-Brace structure provides 100% support for your pool walls without concern for internal or external pressures. • The Fox X-Brace technology is backed by an independent engineering report that proves the Fox X-Brace structural integrity is as we claim. Ask your dealer to show you a copy of this report. We take an extra step when it comes to manufacturing our pools. Each piece of 14 gauge, pre-galvanized steel is totally encapsulated, front and back, with a special powder coating, fusion bonded to the steel at 400 degrees to lockout rust and corrosion. The FoxGard® process of powder coating is used in a variety of other applications where superior corrosion resistance is required. Everyday items like outdoor furniture, electrical and metering devices that endure constant weathering conditions, stadium seats, and other outdoor recreational devices employ powder coating protection. • FoxGard® is applied after all machining processes to ensure complete coverage. • Electrostatic adhesion eliminates drips, sags and other surface imperfections. In addition to the FoxGard® premium pool wall system, Fox offers StanGard™ galvanized walls for a more economical option. StanGard™ features the same freeform panels and components but uses a G235 galvanized finish instead of the FoxGard® epoxy coated finish. Fox’s freeform panels allow you to design virtually any shape pool you want. Fox panels are made to flex laterally while remaining extremely strong vertically. 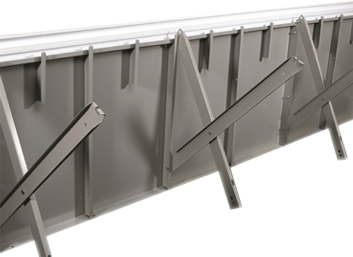 Each Fox panel incorporates a welded Z-bar support every two feet. This gives them unmatched strength while allowing them to be formed to the pool shape you desire. Specially fabricated panels supplied by other manufacturers can delay your pool installation, whereas the Fox freeform panel gives your dealer the freedom to customize your pool without special order items. Web Design and Hosting By Outsource Creations, Inc.